There’s not much in the way of details on the shooters yet in Dallas, where five police officers were shot and killed by as-yet-unidentified assailants during a peaceful protest. 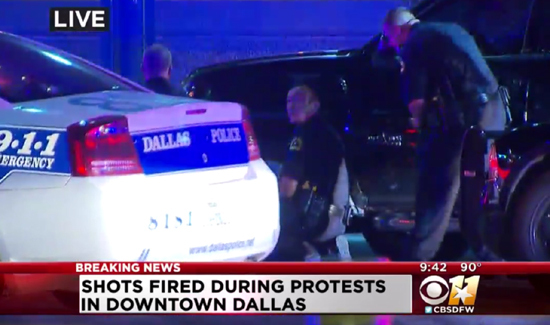 “At least five Dallas law enforcement officers were killed and six wounded Thursday evening as a protest over recent police shootings was interrupted by chaos. After a peaceful march, the downtown suddenly exploded into violence at around 9 p.m. local time when gunshots echoed through the streets, sending protesters and police officers alike scattering for cover. Four Dallas Police officers and one Dallas Area Rapid Transit officer were killed by “snipers” perched atop “elevated positions,” officials said. At least one civilian was also injured. Videos circulating on social media showed an individual with an assault-style rifle shoot a police officer in the back at point-blank range. A gunman, believed to be the same shooter, then engaged in a violent, three-hour standoff with SWAT officers, police said. At around 4 a.m. central time, CNN reported that the gunman had died. Police have not yet confirmed he is dead. Three other suspects were also in custody, Dallas Police Chief David Brown said during a press conference before the standoff’s end. He said police were also investigating a suspicious package left near the site of the shootings. “The suspect that we are in negotiation with that has exchanged gunfire with us over the last 45 minutes has told our negotiators that ‘The end is coming’ and he is going to hurt and kill more of us, meaning law enforcement, and that there are bombs all over the place in this garage and downtown,” Brown said.